The Japanese School Buses either in used or Brand new has worldwide popularity and high-demand for their comfort, durability, toughness, and less maintenance charges. Once you buy an used Japanese School Bus from Japan, you can use for years without any big problem and hassle. The quality of Japanese used school bus in our stock is good, which makes charmful to our customers around the world to import Japanese vehicles in Tokyo. We exist for the purpose of delivering the Best-condition Japanese school used bus, continuing high standards, and gaining the trust of our customer in all over the world. Supported by a frequently changing inventory of used school bus, we have School buses to fit all your needs, including all kind of new Japanese cars for sale in Japan at competitive prices. 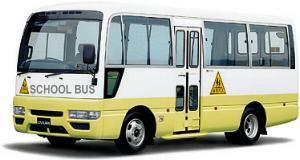 We can supply you with the most ideal Japanese School Bus in the market. Our experience and knowledge in decades has makes Batfa.com your only choice for the "fastest, easiest and most trustable way to purchase Japanese used school bus!" We're Specializing in Japanese school bus sales from decades, and offer all Japanese used Vehicles makers like, Toyota Coaster, Nissan Civilian, Mitsubishi Rosa, Isuzu Journey, and Hino Bus. Browse our inventory of Japanese School Buses at below. * All buses are right hand drive (steering on the right side of bus). * All buses are with Diesel engine. * All buses are tested and in good running condition. * All buses are air conditioned. * Shipping cost and insurance charges are not include in the prices. Bus price US$ 12,400 + Shipping cost to Durban port US$ 3,500 + Marine insurance US$ 120 = Total US$ 16,020. * There are no hidden cost or extra charges except bus price + shipping cost + marine insurance. * To send inquiry click stock No.↓of each bus. * You will send stock No. of interested bus with your full name, full address and telephone number by E-mail. * We'll then issue proforma invoice with our Japanese Bank account details. * You will send payment by wire transfer to our Japanese Bank. * After confirmation of payment by our Bank, we'll send official receipt to you. * The Bus will go to our inspection department for final inspection. * After inspection, the Bus will be sent to our shipping agent. * Our shipping agent will send the Bus with first available ship to your port. * After sailing of ship from Japan, we'll send you original bill of lading and other documents by DHL. contact them by phone or can visit their office for the delivery of Bus.